Happy Friday the 13th and welcome once again to my newsletter! The California High-Speed Rail Authority released a revised version of its business plan last week and discussed it in more detail at its meeting yesterday. Please keep reading for the latest updates in this evolving project. 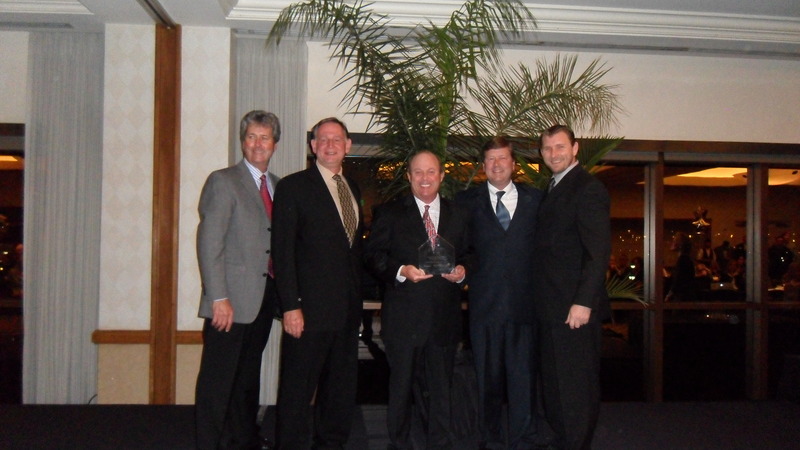 I was proud to receive the SCAG Compass Blueprint Award on behalf of OCTA last week in Los Angeles. This award recognizes a regional project that promotes sustainability and was given for the outstanding work OCTA has done on the Fourth District Bikeways. If you know a high school student signed up to take the SAT this year, the Buena Park Library District is offering free preparation sessions this weekend. Please continue reading for more information. The Board of Supervisors was dark this week. The next Board meeting will be Tuesday, April 17 at 9:30 am in the Hall of Administration, 333 W. Santa Ana Blvd., Santa Ana 92701. Nominations must be postmarked by July 13, 2012 and the winners will be honored at a luncheon in October. For more information, you may contact AQMD’s Legislative & Public Affairs Office at (909) 396-2432 or visit AQMD online. Hopefully, everyone paid the second installment of their property tax by 5 pm last Tuesday because another tax deadline is right around the corner! This year, taxpayers have until Tuesday, April 17, to file their 2011 income tax returns and pay any tax due. This is because April 15 falls on a Sunday and Emancipation Day, a holiday observed in the District of Columbia, falls on Monday, April 16. According to federal law, District of Columbia holidays impact tax deadlines in the same way that federal holidays do. Therefore, all taxpayers will have two extra days to file this year. Taxpayers requesting an extension will have until Oct. 15 to file their 2012 tax returns. For more information, visit the IRS. The Fullerton Arboretum is hosting its Green Scene on April 14 and 15, a weekend-long outdoor garden event. A variety of exhibitors will be on hand to sell plants and other gardening materials as well as to offer educational information and promote plant societies in the community. As of today, the weather is expected to be sunny. For directions, ticket information and other details about the Green Scene, visit the Fullerton Arboretum website! 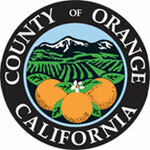 Discussion during Monday’s OCTA Board meeting revealed that funding will be a challenge. As Supervisor Nelson noted, should the State of California issue all $9 billion in bonds for high-speed rail immediately and the federal government today give the $3.5 billion that it has allocated, the total funding would only total less than half of the first phase of high-speed rail, estimated at $31.3 billion. No further funding, private or public, has been identified beyond that. In addition, the CHSRA previously issued an optimistic ridership estimate for high-speed rail, forecasting approximately 30 million passengers per year. Although this figure appears to have been reduced slightly, the most successful corridor in the U.S., by comparison, currently serves approximately 3.3 million on the Acela Express between Washington, D.C. and Boston. As mentioned, the CHSRA discussed the business plan at its meeting yesterday, for which further analysis will be provided to the Board of Directors in the coming weeks, including what impact the reintroduction of Anaheim as the southern terminus has on the project’s most recent cost estimate. In the meantime, the most recent presentation given to the Board is below. This recent article contains more of Supervisor Nelson’s reaction to high-speed rail. The Angels Express is back this season providing service to all Angels weekday home games that start at 7:05 p.m. This year, the Angels Express will begin offering service on the IEOC Line for every Friday night game. For only $7 roundtrip, adults can ride to and from Angel Stadium, $6 for senior/disabled, $4 for youth (ages 6-18), and free for children 5 and under with a paying adult (up to 3 children). The train goes straight to the stadium’s parking lot so the game is just a short walk away. To see a photo slideshow of last week’s express, click here. If you happened to be driving on the 5 freeway late Wednesday night heading into or out of L.A. County, you may have noticed a detour. The reason for this was a full freeway closure at Alondra Boulevard from midnight to 4 am for improvements. This will resume next week from Monday, April 16 to Thursday, April 19 during the same time period. 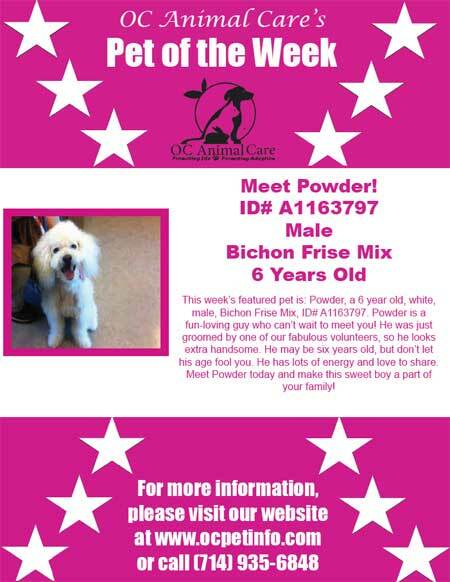 Additional details can be found on the flyer below. 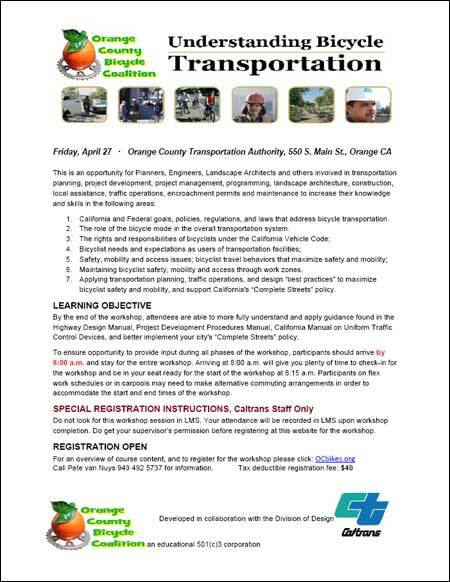 For more information, please call (855) 454-6335 toll-free or visit http://i-5info.com/. 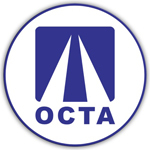 On Monday, the OCTA Board of Directors approved various changes in the way the seven grade separations will be paid for, which directly affects Fullerton, Anaheim and Placentia in the Fourth District. The City of Fullerton’s contribution to the OC Bridges project decreased from $10.6 million to just under $5 million since it has been the only city to commit financially. The railroad company, BNSF, will contribute $8.9 million to the project, funding that would have otherwise gone to ongoing maintenance costs due to continuous vehicle traffic over the tracks. Some parts of the project that were initially considered eligible for federal funding were discovered not to be once more detailed estimates became available, requiring the need to secure alternative funds. As a result, state funding from Proposition 1B has been increased to compensate for this reduction. The Southern California Association of Governments (SCAG) 2012 Compass Blueprint Recognition Awards recognize the great planning and development work occurring throughout the region. These plans and projects coordinate land use and transportation actions, demonstrate excellence in planning and design, and most importantly, work towards improving the mobility, livability, prosperity and sustainability of our region. 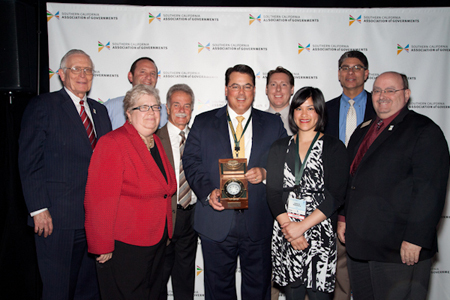 The 4th Supervisorial District Bikeways Collaborative received an award for Excellence in Visionary Planning for Mobility. For more information, please visit http://www.compassblueprint.org/. 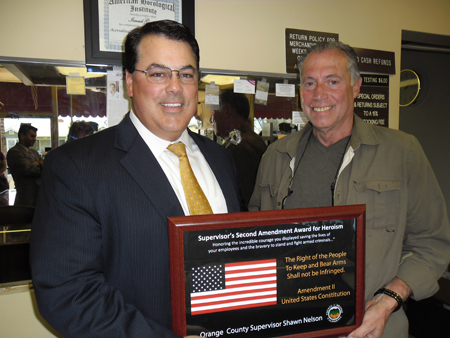 (Fullerton, CA) – Orange County Supervisor Shawn Nelson honored long-time Fullerton jewelry store owner Ismael “Ish” Gomez with his 2012 “Second Amendment Award for Heroism” in recognition of the incredible courage he displayed in saving the lives of his two employees last month during an attempted take-over robbery by five armed suspects. Mr. Gomez’s heroism resulted in one suspect being hospitalized, the other four in jail and earned accolades from friends and professional associates for protecting the lives of his imperiled employees during a dramatic hand-to-hand, bullet-firing confrontation against violent criminals. A reminder of the struggle remains evidenced in the mirror behind Supervisor Nelson and Mr. Gomez weeks after the altercation. OC Parks received an Award of Excellence from the California Park & Recreation Society for its Annual Lake Management Program. OC Parks’ recognition in the category of Creating Community Award of Excellence – Park & Facility Maintenance Management was honored at the 2012 California and Pacific Southwest Recreation and Park Training Conference, held in Long Beach, CA, March 21-23, 2012. North Parks Division Manager Steve Bonhall, center, flanked by OC Parks Director Mark Denny and Deputy Director Mike Brajdic. A Free Practice SAT to be held at The Buena Park Library District! Kaplan is sponsoring a free practice SAT at the Buena Park Library on Saturday, April 14th from 10:00 a.m.-2:00 p.m. High School age students will have the opportunity to take a full-length SAT test under realistic testing conditions without affecting their college record. 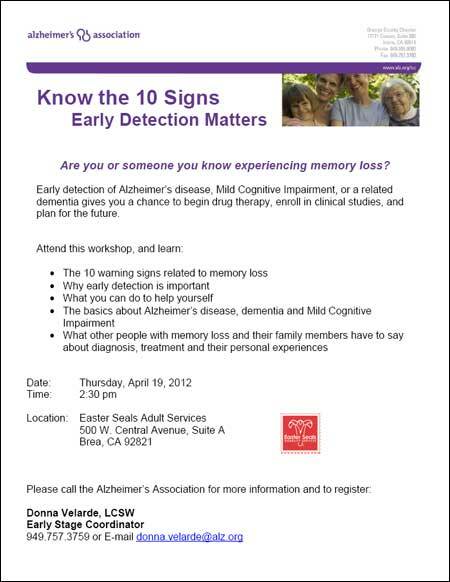 Registration is required for this event. Students can register in person at the Information and Reference desk at the Library, by calling 714-826-4100 ext.125, or online at kaptest.com/practice test. Participating students need to bring a basic calculator and two #2 pencils to the practice test. For all participating students and their parents, there will be a SAT score back and SAT Test Strategies 101 Workshop on Thursday, April 26th from 6:00-7:00 p.m.
For more information, please call the library at 714.826.4100 x125, or visit our virtual branch at http://www.buenaparklibrary.org. The Buena Park Library is located at 7150 La Palma Ave. The Library is open Tuesday through Thursday, 10:00 a.m. – 8:00 p.m. and Friday and Saturday, 10:00 a.m. – 5:00 p.m.
For questions or comments regarding Nelson’s E-News please contact the Supervisor’s office staff: Audra Adams Ph: 714-834-3440 Email: audra.adams@ocgov.com. This entry was posted on April 15, 2012 at 6:04 PM	and is filed under 4th Supervisorial District. Tagged: Shawn Nelson. You can follow any responses to this entry through the RSS 2.0 feed. You can leave a response, or trackback from your own site.